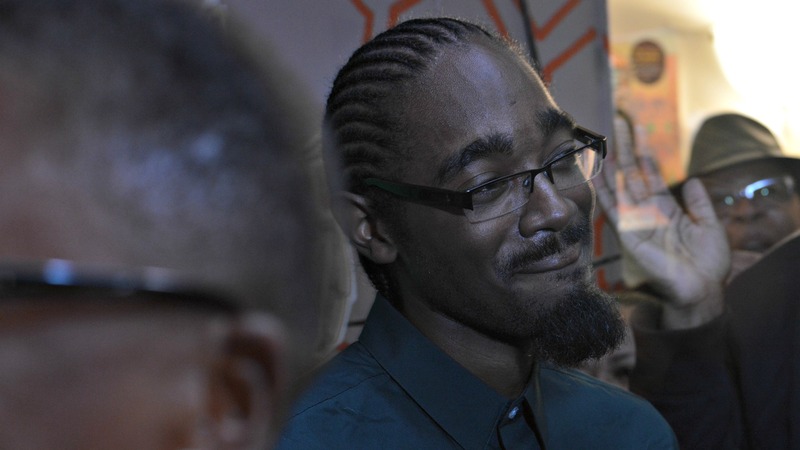 At this moment, Lindell Smith is not the prototypical politician. His tall and lanky frame isn’t clad in a suit and he doesn’t address the crowd from a lectern. 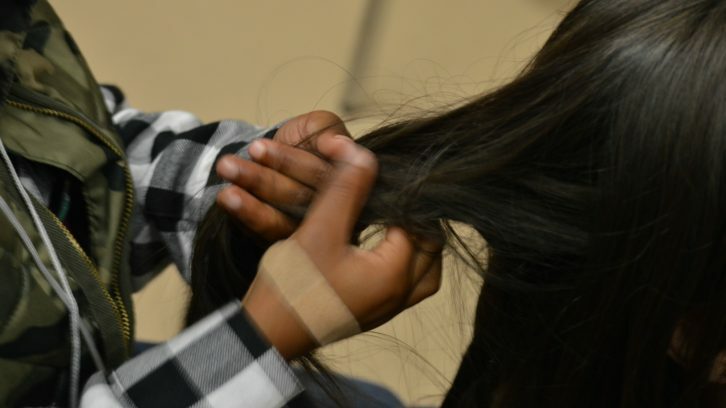 He wears a green, button-down shirt and his hair is braided into tight cornrows. He climbs on top of a table at the back of Alteregos, a cafe on Gottingen Street, to address the crowd. The packed room of supporters in the cafe falls quiet as he speaks to what they have accomplished — electing the first African-Nova Scotian to Halifax regional council in 16 years. Smith’s win was a landslide victory. The community outreach worker defeated his six challengers, taking 53 per cent of the vote in District 8 and winning one of 16 seats at city hall. 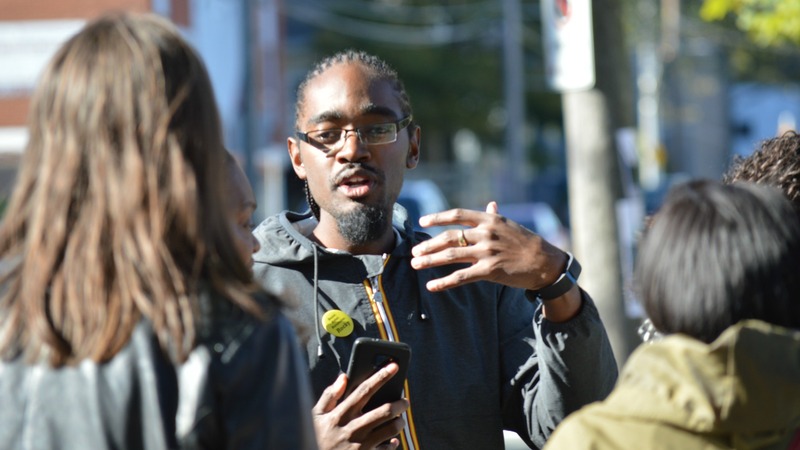 Smith became the first African-Nova Scotian elected to council in 20 years, since amalgamation and the creation of the Halifax Regional Municipality (HRM). At the age of 26, he’s the second youngest councillor in the history of the HRM and city of Halifax. 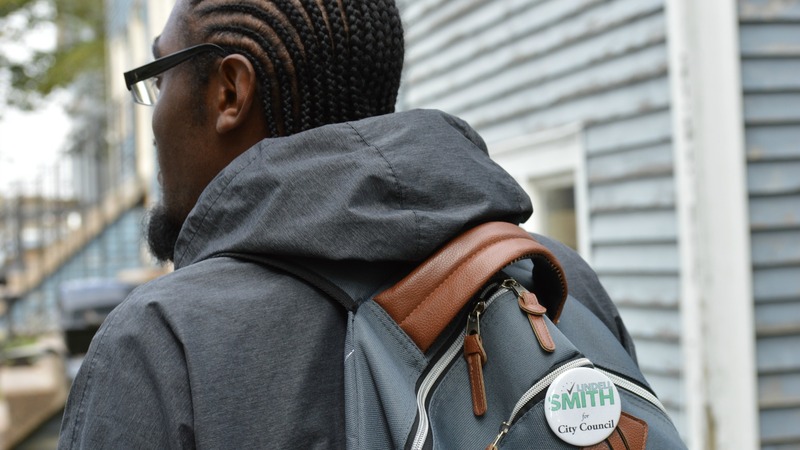 For Smith, whose home has always been a “few steps” from Gottingen Street, becoming councillor is an accomplishment he never thought he’d achieve. Smith grew up in Uniacke Square, an area that for much of the 1990s was stricken by gang violence and drugs. It’s a life Smith admits doesn’t lend itself to the making of a future politician. As a kid he went to school at St. Joseph’s-Alexander McKay Elementary, then later to St. Patrick’s Alexandra, St. Patrick’s High School and eventually Citadel High School. He also spent a lot of time at the Halifax North Memorial Library. He even got his first job there and eventually became the organization’s community outreach worker. Recently, the area Smith knew as a child began changing – new condos, new businesses, new people – and he wondered if residents were benefiting from the gentrification around him. Yet Smith never had an interest in politics. When former District 8 councillor Jennifer Watts announced she wouldn’t run for a third term, Smith got busy looking for a suitable replacement. Once the suggestion was public, it didn’t take long for those around Smith to voice their support. By the time he announced his candidacy in April, the suggestion had became a goal. Smith’s father, Lindsay Smith, never expected his son to have a career in politics. 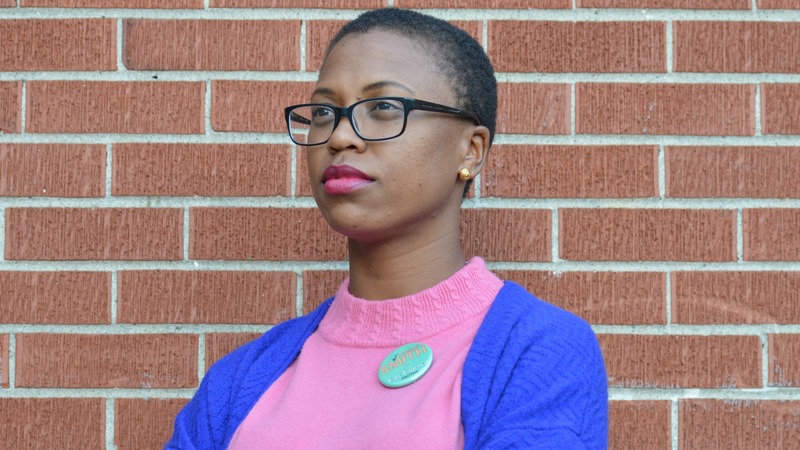 For Smith’s campaign manager, Jalana Lewis, taking the job was an easy decision. 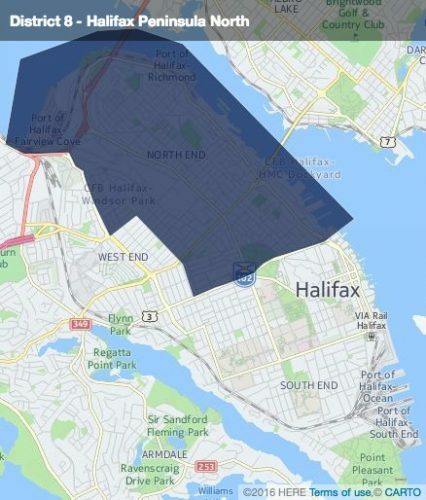 Halifax’s north end is an area in flux. New housing developments, shops and restaurants are popping up all over a district that has traditionally been blue collar, but not every part of the district has received the same level of attention. Smith, who has lived in Uniacke Square for his entire life, knows this better than most. It’s why a large part of his platform focused on community growth and consultation. Nova Scotia has always had, and continues to grapple with, a lack of racial diversity. The 2011 National Household Survey determined that just under five per cent of the province identified as a visible minority. Visible minorities haven’t been strongly represented within Halifax municipal council. Of the 16 councillors who made up the last council, four were women and 12 were men — all of them were white. Watts was thinking of this as she was ending her last term as councillor of District 8. With Watts out of the race, Smith found himself facing a few challengers early on: Brenden Sommerhalder, the communications director of the Downtown Halifax Business Commission; Chris Poole, a community worker in the north end; and Anthony Kawalski, a British-born artist and photographer. Three others came forward later: Patrick Murphy, a former councillor; Irvine Carvery, a former candidate for the Conservative Party in the 2015 federal election; and Martin Farrell; a Halifax resident whose family had lived in the area for five generations. It was a packed field, with candidates of various ages and backgrounds. Three were visible minorities. Neither Smith, a political novice, nor Lewis as a first-time campaign manager had a problem with the long list of candidates. Lewis, a graduate of Dalhousie University’s law program, decided that if this was the first political campaign she would run, then it might as well be the toughest. As the election crept closer, Smith found it harder to juggle time between his personal life, his work and the campaign. He took an unpaid leave of absence from his work for the two months leading up to the Oct. 15 vote. Smith financed his campaign through crowdfunding and donations, which he capped at $100 per person. He survived off limited savings, but the loss of a personal income hit him pretty hard. “It’s been tight,” he said. In Halifax, like most municipalities in Canada, municipal elections are non-partisan. Without the ability to rely on larger entities to fund a campaign, it’s up to a candidate to decide how much they are willing to spend. Without a party label, the candidate is essentially forced to sell themselves to the voter. With only 20,790 African-Nova Scotians in the province, the community in Halifax is fairly small, but it’s a tight-knit community. 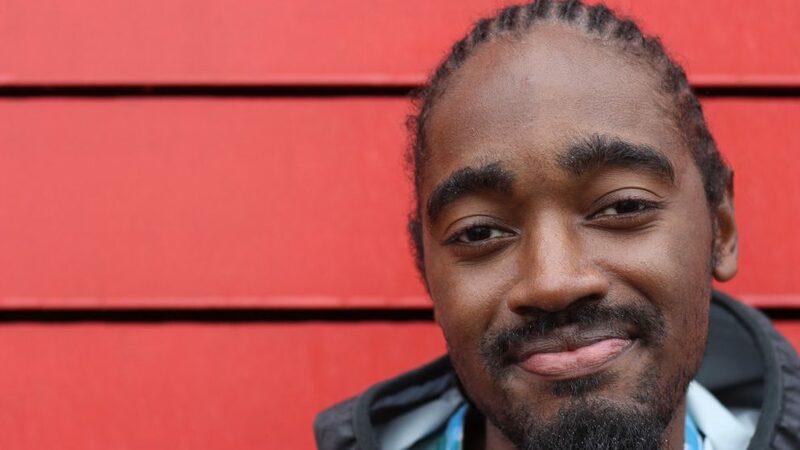 Four years his senior, Lewis didn’t cross paths with Smith in school, but when she returned to Halifax in April she was already hearing good things about him. 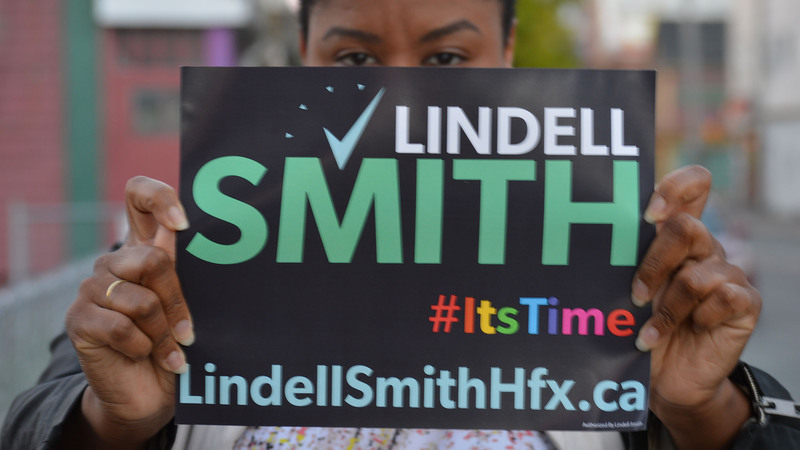 Knowing that Smith already had a campaign platform and a slogan, “#ItsTime,” made for an easy transition. “At the end of the day we decided to let Lindell be Lindell,” she said. Zachary Taylor, an expert in municipal elections at the University of Western Ontario, says every political campaign has two components: the air war, waged through advertisements on television and radio, and the ground war which relies on volunteers to go door to door and encourage people to vote. Lewis, having learned the lesson from conversations with experienced politicians like Mike Savage, the mayor of Halifax, put the ground war into play early. Smith’s early announcement, combined with the support of about a dozen early volunteers, allowed them to get him in front of voters early and often.The hard work paid off. Signs promoting Smith sprouted up all over the north end of Halifax. Less than a month before election day Smith received some of the best news a rookie political candidate can get. Within a week of each other he snagged a pair of high profile endorsements from former Halifax Needham MLA Maureen MacDonald and former Halifax MP Megan Leslie. Both knew him from his work in the community, and while he wasn’t expecting any endorsements, he was grateful. “For Maureen to endorse me that gave me a wow kind of factor,” Smith said. One day, he had the opportunity to go door knocking with the former MLA. But would everyone be as receptive? Every door Smith knocked on provided the opportunity for an awkward question. “There was one time where I went to a door and once the man found out I was running for council, he asked me to come in and tell his son that he should stop listening to gangster rap,” he said. Smith’s campaign team had to remind him not everyone was going to be receptive to him. The vitriol that Smith received online was much worse than face-to-face. 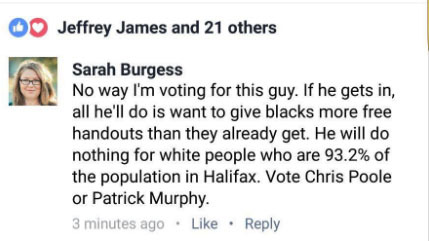 Posts on Facebook and Twitter would question his ability to lead a community that wasn’t African-Nova Scotian. The comment below was one example. Smith addressed this in front of a crowd of about 80 people at the Northwood Centre during the second debate. “I care about working for the HRM, our city, our neighbourhood, our neighbours, our kids,” he said. He clutched the microphone in two hands as his voice quaked with anger. Smith sat down in his seat to thunderous applause. His biggest fan was outside in the hallway. Jalana Lewis and Katherine Taylor, one of the campaign’s core volunteers, watched over Smith’s seven-year-old daughter, Jahtaya, who wasn’t interested at all in the debate. She found one of the only vending machines in the area and grabbed a cookies and cream bar. Jahtaya, the only child at the event, sprinted into the hall at the end. She refused to leave his side as he finished the night by answering questions. Smith left holding her hand. He carried the cookies and cream bar in the other. Oct. 15, or E-day as it’s known within the campaign, plays out as if it’s scripted. It’s an early day for everyone involved. With polls open for 11 hours, it is essential to get out the vote. Lewis has organized the nearly 30 volunteers, with duties ranging from knocking on doors, driving voters to polls and serving as observers at polling stations. Observers are allowed to check who has voted, giving a rough estimate of how the campaign winds are blowing. Smith’s headquarters operate out of the Leave Out the Violence office, just off of Gottingen Street. There is a steady stream of volunteers flooding in and out of the building. They span a diverse range of age groups, races and religions. “He’s just so passionate about helping people,” says LaMeia Reddick, a campaign volunteer. She lives in another district and can’t even vote for Smith. Smith’s girlfriend is at his side for support. Verena Rizg surprised him the night before. Having recently taken a job in Ontario it had seemed unlikely she would be able to fly back for election day, but campaign volunteers pitched in and sent her a ticket. “I guess they just knew that he would need me to get through the day,” she says. She is sporting a customized pink button with ‘Team Lindor’ scrawled on it in black Sharpie. It’s the nickname that she’s called Smith since they started dating. 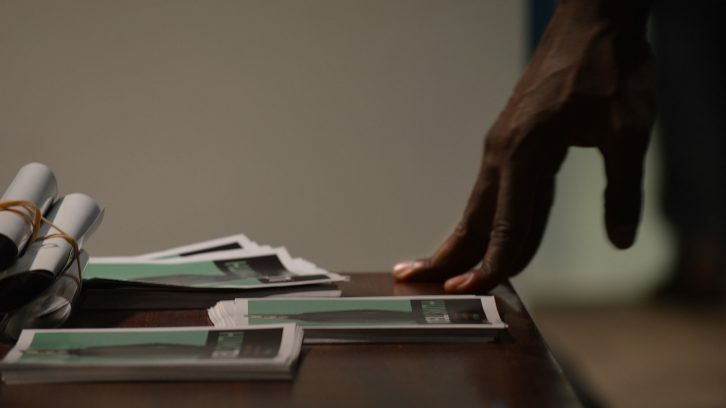 Midway through the day, Smith, who has yet to cast his vote, tweets out to his followers that he’ll be organizing a meeting at the George Dixon Centre. He tells his supporters they should vote at the same time. He streams the event on Facebook Live as he, with nearly 30 people behind him, makes his way four blocks from the George Dixon Square to the YMCA polling station. After voting, Rizg, Smith, and the couple’s friend Alvin Tynes, wander around Gottingen Street. Every few feet they stop, either to encourage a passerby to vote, or to chat with someone wishing Smith good luck. Before the polls close, they make their way to Lion & Bright, a local bar, that had named a gimlet after Smith’s campaign slogan. As the polls close, Rizg, Smith and Jahtaya change into formal clothes in the campaign’s already empty headquarters. Most supporters are already at Alteregos for the party. The trio pose for selfies and photos, making sure their clothes match with one another. “My favourite part of this is that I get to dress him,” Rizg says, pointing to Smith’s emerald green shirt. No one dares to think what will happen if Smith loses. He leaves with two speeches in his pocket, one for if he wins and another for if he loses. They’re at Alteregos when the results come in. Smith doesn’t need his concession speech. Only Lewis and Smith know what was in it. For the 26-year-old, there is a lot to be done in the next four years. Luckily, Smith has been given some advice by Robert Stapells, the man who holds the record for youngest councillor in Halifax. Stapells was only a few months younger when he was elected. The two men met while Smith campaigned door to door. Now, Smith’s focus is on his upcoming term. While he is familiar with the needs of the community, he says he’s still learning about council procedures. “I hope that I’ll make a difference. People think that politicians are all bad people, but a politician isn’t a bad person,” Smith says. 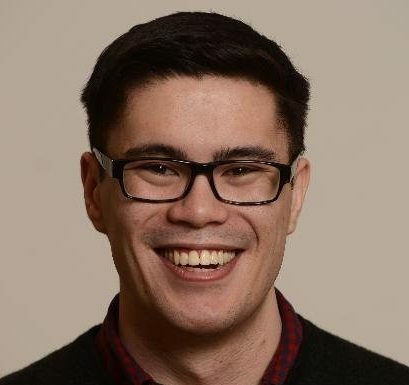 Alexander is a freelance journalist from Saskatchewan with an interest in political reporting and data journalism. 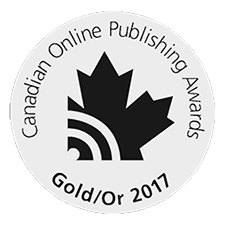 He’s currently working on his master of journalism degree at the University of King’s College in Halifax. You can normally find him tweeting @AlexanderQuon. All content for this story was produced by Alexander. We need more community driven people like Lindell! You can feel his love for all Haligonians. He’s an inspiration. Congrats to him! He had a solid team with a great manager like Jalana. Thank you Alexander for a great article,l especially like the comment made by his campaign manager Jalana Lewis.We decided to just allow Lindell to be himself.l was at the opening of his campaign,and l looked around at the people that were present.The crowd was very diverse,young,older,children,educated and not so educated,aboriginal,black,white every one.When Lindell said “it’s TIME”l knew he was the one for the job.l hope we allow him time to learn and grow,for our city of Halifax.We are so proud of you LINDELL.WE got your back. Kudos to you, Alexander. Just like Lindell, Jalana and their crew, you have TAKEN CARE OF BUSINESS with this superb article. Wishing you the very best in your journalism career. Our profession needs more like you. well done! the photos are great and show a variety of point of views. i esp like the pic of L and Verena on election night. So proud of you Lindell! Alex, what a thoughtful, educational and interesting read!!! I also loved the photos!!! Especially the hand shot on the photographs!! !